Can I volunteer for the Boulevard Lakefront Tour? I’d like to ride a different route than the one I chose when I registered. I want to bring my child with me. Do I have to pay for him/her? What about riding a tandem—do I have to pay for two people? Why do I need my rider and helmet numbers? What do I need to bring the day of the ride? If you have registration problems online, please contact us at [email protected]. Can I volunteer for the BLT? Boulevard Lakefront Tour needs volunteers in many capacities before, during and after the ride. Volunteer registration opens soon; please check back for an update at that time! The route options on our sign-up form are for our planning purposes only. Feel free to ride whatever route you like—just make sure you’re there at the right start time. Our rule for the Boulevard Lakefront Tour is “If you pedal, you pay.” This means that children on their own bikes or those being pulled on a trail-a-bike must pay to ride. Children in trailers ride for free. Our rule is, “If you pedal, you pay.” So, a tandem needs two paying riders, as does an adult rider with a child on a trail-a-bike. Children that are being pulled in a trailer or on a child’s seat on an adult’s bike do not need to pay. The ride starts and finishes at the University of Illinois at Chicago's Parking Lot G (921. South Marshfield between Polk & Taylor Streets). Your rider and helmet numbers let event staff and volunteers know you are part of the ride. Please have your number visible at all times so that staff and volunteers know that you are registered. Your numbers are your access to the ride rest stops and washrooms. For safety purposes, we recommend you do not wear headphones. BLT will be held rain or shine. Because proceeds from Boulevard Lakefront Tour support the efforts of our nonprofit organization, we do not offer refunds. Your investment in this event goes directly toward making Chicagoland a better place for people who bike, walk and take transit. 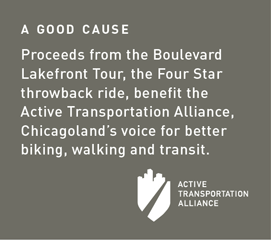 Registration for Boulevard Lakefront Tour is $35 ($30 for current Active Transportation Alliance members). Youth 17 and under pay $16. You can also save on registration while supporting a worthy non-profit; registration and an Active Trans membership is $50. Day of registration will be available at the event for $45. . Your event registration is a donation that does not exceed the fair market value of the goods and services received, and is not eligible for a tax deduction. However, memberships and donations that are processed with your registration are considered charitable contributions and may be eligible for a tax deduction. Donors will receive a receipt acknowledging the value of charitable contributions after the transaction is processed. If your question isn’t answered on the web site, feel free to email us at [email protected], call the Active Transportation Alliance at 312.427.3325.